What do Leonidas, Charlemagne, and Napoleon all have in common? Forget historical context - we squished all three of those suckers flatter than a Fruit Roll-Up with a giant boulder. We crushed Louis XIV with a herculean flaming rock - a fitting end for the Sun King - and trampled Leonardo da Vinci into a not-so-symmetrical version of the Vitruvian Man. Controlling our gargantuan rolling stone, we destroyed buildings, cows, catapults - everything in our path, really. Hell, we did enough rollin’ to put Fred Durst to shame. Most importantly, we had fun doing it. Rock of Ages has a unique pop-out-book visual style and is based on a simple premise: control a rolling boulder (think Marble Madness) to steamroll your opponent while employing tower defense mechanics to shield yourself from similar enemy attacks. The game’s single-player story mode is based on Sisyphus of Greek mythology, who was tasked with rolling an immense boulder up a hill for all eternity. The real kick-in-the-teeth for poor ‘ol Sisyphus was that he was doomed to fail. Forever. But not in Rock of Ages. He decides to use his cursed boulder to wreak havoc, and he starts by turning Agamemnon into a Greek pancake before taking on a variety of historical figures from multiple time periods. It’s a mostly delightful experience that falls short in some regards. Every level in the game is set up with two mirrored sides. Controlling Sisyphus’ boulder, you’re tasked with ramming the gates of your enemy’s castle while simultaneously building structures to slow the approach of your foe’s boulder. The first player to knock down the opponent’s gates and flatten the inhabitant of the castle wins. It takes multiple boulders to down a castle’s sturdy gates, and a new rock is built each time you successfully land a blow. You can spend the money you accrue from squishing enemy structures to place defensive units of your own: stone towers somewhat hamper enemy progress, catapults launch offensive projectiles to knock a boulder off its path, and animals, such as cows or mammoths, attempt to form living roadblocks. Unfortunately these defensive units rarely make much of an impact, as they’re easily avoidable (and even easier to destroy). Furthermore, steering our giant ball-o-death was difficult once we built up some momentum, and we accidentally launched our boulder off stages so many times that we began to furiously cartwheel out of sheer frustration. 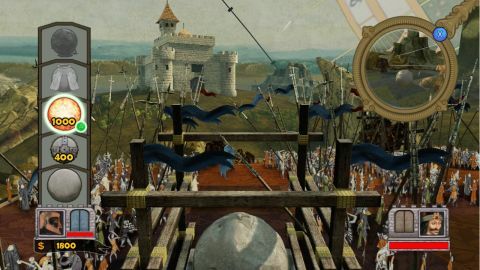 This, combined with weakly executed tower defense mechanics, usually resulted in a race to see who could fall off the world less - there is no penalty for doing so aside from allowing the other player to gain some ground and reach your castle gates first. Gameplay never becomes too stale thanks to a nice variety of levels themed appropriately to whichever time period they represent: Ancient Greek, Medieval, Renaissance, Rococo, and Romanticism. Unfortunately, a chunk of the stages are so twisty-turny that we occasionally felt too restricted, limiting the speed and destruction we were so anxious to obtain. Boss battles are thrown in at the end of each time period, and while these encounters are often funny and sometimes fun, they usually require an annoying amount of precision to successfully hit the boss’s obvious weak spot. This is made even more difficult thanks to claustrophobic camera angles that can’t be adjusted. But despite its shortcomings, Rock of Ages is fun to play. The story mode is littered with hilarious cutscenes, references to films, and plenty of self-awareness. Before smashing Leonardo da Vinci into bits, Sisyphus is told he will never escape his destiny - that he’s actually a part of some strange futuristic “videogame” thing. An encounter with Leonidas results in a very obvious nod to 300, and we saw plenty of other enjoyable allusions along the way. For those looking for a bit of rock ‘n roll competition (zing! ), there’s a nice amount to be found here. War mode is essentially a multiplayer version of the story mode. SkeeBoulder is a point-based competition that nixes tower defense elements - you have to roll your boulder into score-increasing targets before launching it up a Skee-Ball ramp for extra points. Time-based challenges (complete with online leaderboards) are also available, allowing you to breeze through a level without worrying about destroying any castle gates. Description Squishing hundreds of not-so-innocent townsfolk and buildings with a giant boulder is a rockin good time.